Star Trek II: The Wrath of Khan, the epic science-fiction adventure that continues to captivate audiences, marks its 35th Anniversary with a two-day-only return to cinemas nationwide. The Star Trek II: The Wrath of Khan 35th Anniversary screenings will be presented in a digitally remastered Director’s Cut and, as an added bonus for Star Trek and movie fans, William Shatner will appear in a newly produced in-depth interview that will play before each screening. 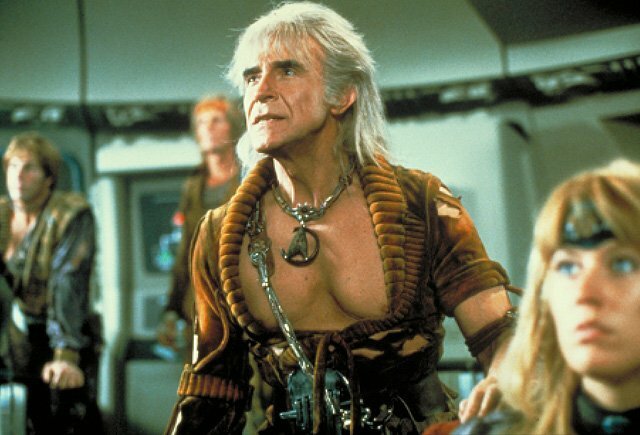 Click here to purchase the Star Trek II: The Wrath of Khan Director’s Cut on Blu-ray! Fathom Events and Paramount Pictures will present Star Trek II: The Wrath of Khan on Sunday, September 10, and Wednesday, September 13, at 2:00 p.m. and 7:00 p.m. local time each day. Tickets for the Star Trek II: The Wrath of Khan 35th Anniversary screenings can be purchased online by visiting FathomEvents.com or at participating theater box offices. Moviegoers throughout the U.S. will be able to enjoy this event in more than 600 select movie theaters. For a complete list of theater locations, visit the Fathom Events website (theaters and participants are subject to change). Director Nicholas Meyer’s Star Trek II: The Wrath of Khan was a box-office hit upon its release – the sixth highest-grossing film of 1982 – and continues to be revered and quoted by fans. The film, a continuation of the original Star Trek series episode “The Space Seed,” finds longtime Starfleet nemesis Khan Noonien Singh (Ricardo Montalban) alive and well, marooned on a seemingly lifeless planet. When he’s discovered by Chekov (Walter Koenig), Khan will stop at nothing to exact revenge against the man who exiled him on the barren world: Admiral James T. Kirk. Kirk must lead his loyal crew – including Spock (Leonard Nimoy), Bones (DeForest Kelley), Uhura (Nichelle Nichols), Sulu (George Takei), Scotty (James Doohan) – and an unprepared group of trainees led by half-human, half-Klingon Lt. Saavik (Kirstie Alley) in a race against time to stop Khan from deploying a device that threatens the entire universe. Bibi Besch, Paul Winfield and Merritt Butrick also star in the film, which features an unforgettable musical score by the late James Horner. The Director’s Cut of Star Trek II: The Wrath of Khan is currently available on Blu-ray, with more than two hours of in-depth bonus features.